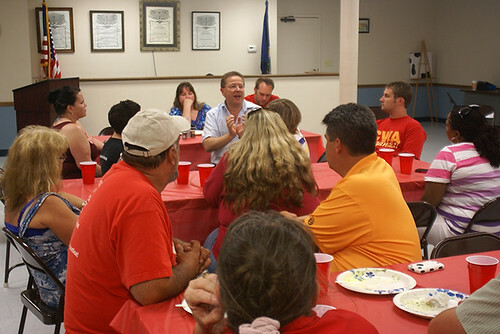 In Wichita, Kans., T-Mobile activists and CWA members from Local 6402 talk with ver.di leader Lothar Schröder on the tough fight for organizing and bargaining rights at T-Mobile USA. The company closed seven call centers last month. CWA was successful in gaining Trade Adjustment Assistance benefits for up to 3,300 T-Mobile USA workers after the company closed seven call centers in June. CWA provided the Labor Department with information from call center workers in the Philippines and Central America regarding the large quantity of T-Mobile calls being handled by their centers. CWA presented affidavits from workers in the United States documenting work being sent overseas, emails from one call center requesting volunteers to train Philippine workers, local job ads for outsourcing companies referencing T-Mobile and other documentation. But the company continues to deny that the jobs at these centers were offshored. The Labor Department granted CWA's petition and confirmed that because "there has been an acquisition from a foreign country by the workers' firm of article/services that are like or directly competitive with those produced/supplied by the workers' firm," workers should receive assistance. The TAA benefits designation makes employees eligible for enhanced unemployment benefits, tuition assistance for job retraining programs and tax credits for family health insurance, among other benefits. "T-Mobile disrupted the lives of 3,300 workers and their communities. The TAA benefits program exists so workers do not bear the cost of corporate decisions to close U.S. facilities and send that work overseas," said CWA Chief of Staff Ron Collins. T-Mobile USA, a subsidiary of German-based Deutsche Telekom, closed call centers in Allentown, Pa.; Fort Lauderdale, Fla.; Frisco, Texas; Brownsville, Texas; Thornton, Colo.; Redmond, Ore.; and Lenexa, Kansas. The TAA benefits designation for T-Mobile USA employees comes a month after a majority of Republicans in the U.S. House of Representatives refused to allow a vote on the bi-partisan "U.S. Call Center and Worker Protection Act" (H.R. 3596) that has over 130 co-sponsors. The bill would prevent corporations from receiving any type of federal loan, grant or tax subsidy for five years if they decide to move U.S.-based call center jobs overseas. Further, the bill requires that U.S. consumers be told of the location of the agent to whom they're speaking, and gives consumers the right to be transferred to a U.S.-based call center.